SAN FRANCISCO, October 1, 2018 – By 2021, the combined market size of augmented and virtual reality is expected to reach $215 billion USD, according to Statista. The same source also projects that the music market worldwide would increase to $43 billion USD by 2020. New developments in streaming, immersive music production tools and VR have paved the way for the merging of these two industries. Keyframe-Entertainment is a San Francisco-based specialized branding and strategy firm, which produces, supports and distributes cutting-edge projects. 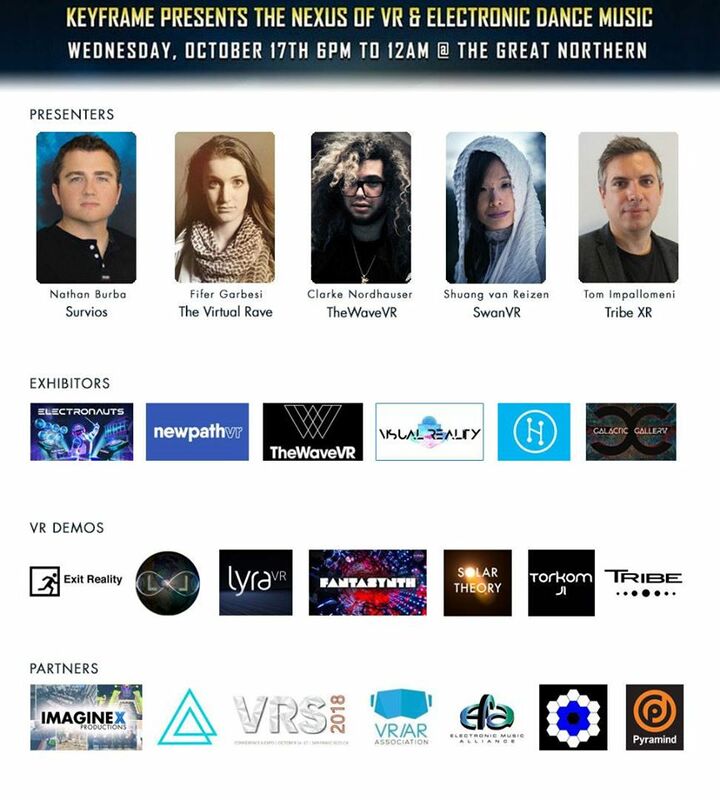 On Oct. 17 at The Great Northern in San Francisco, Keyframe will showcase the convergence of VR and Electronic Dance Music with talks from Nathan Burba of Survios (Electronauts), Clarke Nordhauser of TheWaveVR, Tom Impallomeni of TribeXR, Fifer Garbesi of The Virtual Rave and Shuang van Reizen of SwanVR. The event will also include demos from High Fidelity, Exit Reality, Liquid Light Project, NewPathVR and Visual Reality, as well as performances by Solar Theory, Torkom Ji and Michael Strauss. The event is co-produced with ImagineX Productions and ARTandVR and garnered sponsor support from SUBPAC, Pyramind, Chronos Global Academy, VRARA, EMA and the VRS Conference. Occurring on the same week, the VRS Conference is part of Greenlight Insights' XRSWeek, the premier annual gathering of senior executives, innovators and honored officials offering dialogue and insight into the future of immersive technology. The Keyframe event occurs on the evening of Day 2 of the VRS Conference. I hope the event inspires, educates and entertains. We're planning a grand finale featuring a VR music feed streaming into the event, multiple VR demos and much more. Presenting at the event is Nathan Burba, the co-founder and president at Survios, a virtual reality company headquartered in Los Angeles, California. The company develops virtual reality software and games including the titles Raw Data, Sprint Vector, Electronauts and Creed: Rise To Glory. It also operates Survios-branded Virtual Reality Arcades and a worldwide VR software distribution network operating in 36 countries. Since its inception in 2013, the company has raised over $54 million in venture funding led by Shasta Ventures, Lux Capital and Metro-Goldwyn-Mayer Studios. Known to most as video game DJ and remixer GRIMECRAFT, TheWaveVR CEO Clarke Nordhauser will also be presenting at the event. Earlier this year, TheWaveVR raised $6 million in venture funding for its social VR platform and community for VR music and visual arts experiences. In August, the company collaborated with Imogen Heap, the Grammy-award winning musician, in launching her social VR concert experience, hosted on TheWaveVR platform. TheWaveVR collaborates with artists across a variety of genres to bring social VR experiences to a growing community of people, helping them find new friends and discover new music and artists. The company is pushing the boundaries of VR, enabling new musical and visual experiences that currently do not exist anywhere else. Event host Fifer Garbesi is VR producer/director of The Virtual Rave and a documentarian from Northern California, with award-winning content in Ghana, Tanzania, Cuba, Spain and the United States. Her 360-degree documentary ¡Viva la Evolución!, exploring underground dance in Cuba, screened at Cannes NEXT, The World VR Forum and Raindance. She has received support for her work from Google JUMP and Oculus Launchpad and produced content for the Nobel Peace Prize. Keyframe-Entertainment is the executive producer of her experience “Explore Damanhur,” a virtual 360-degree experience of Damanhur, the “laboratory of the future for humankind,” now available on Gear VR. “Electronic music events offer transcendental audio-visual immersion through digital technology. VR is the only medium robust enough to capture this art form in all its glory,” states Fifer Garbesi. Another presenter is Tom Impallomeni, CEO and co-founder of Tribe XR, the Immersive Skills Training platform. Tom is a serial startup founder and operator, having built and co-founded startups including SuperAwesome. Tom is an advisor to startups including FireTech Camp (technology camps for kids and teens), Aflete (influencer marketing) and Pyramind (music school). Shuang van Reizen of SwanVR is a VRtist experimenting with embodying flow and dance in alternative realities. Her global debut was from her “If You Want to ESCAPE with Me” Beat Saber video that went viral to over 100 million views. She collaborates with other developers and creators such as Android Jones in creating compelling videos to engage new people not familiar with VR. The event will also feature exhibitors Galactic Gallery, Visual Reality, Torkom Ji, Michael Strauss, Liquid Light Project and NewPathVR. There will be VR demos by EXIT REALITY, including Fantasynth, LYRA, Audioshield and Tiltbrush, as well as a music performance by Solar Theory (Torkom Ji and Divasonic). “I’ve had a lifelong trajectory of animation and electronic music in my life. This event is a manifestation of my professional experience as well as a contribution to both industries. I’d like attendees to understand the evolution of electronic dance music in the virtual reality space and how artists and engineers are using these new tools to express themselves in a digital environment. I hope the event inspires, educates and entertains. We’re planning a grand finale featuring a VR music feed streaming into the event, multiple VR demos and much more,” Julian Reyes adds. Get tickets at Eventbrite: https://keyframe_dancemusic_vr.eventbrite.com. View the event on Facebook: https://www.facebook.com/events/1817902218233309/. Keyframe-Entertainment is a specialized branding and strategy firm, which produces, supports and distributes cutting-edge projects. Keyframe-Entertainment and its team have been selected as finalists for the 2018 Mars City Design project and are also currently working on electronic music and festival culture VR-related projects.